The architect is usually your ﬁrst professional appointment. Aside from the obvious work of designing the building, the Architect has an important role in helping the client deﬁne their brief, in providing the church with the means to spread their vision for the project, and to advise on the appointment of the professional team. Being clear about what you are buying is crucial, and primarily that is not a technical service but a pivotal strategic relationship through and around which the rest of the project will revolve. The core skill of an architect – the technical part of designing a building and translating that design for a builder to build – should be a given. Once you are satisfied that your shortlist is technically competent, what you are really trying to decide is what each of these people would be like to work with. Trust and personality ﬁt are very important. You should think of your Architect as your ‘critical friend’. It takes a long time to become a competent architect, because the role involves such a broad range of skills. The ideal is to find someone who has been practising long enough to anticipate the pitfalls on the journey, while being young enough (or young enough of mind) to bring energy and imagination to the design. It is certainly good to ask to see examples of similar work, but the danger here is that you will get a ‘Blue Peter’ solution (‘Here’s one I prepared earlier’); for that reason, a designer’s best building is sometimes the first one they do of that type. Think too about the type of project – new buildings are relatively simple (!) and have much in common across building types, but if your church is a historic one then you most definitely need a designer who respects old buildings and is skilled in combining old and new. Architects’ practices come in many shapes and sizes, with lots of architects working on their own or with one or two others. At this end of the profession an individual may well have the skills to take on large projects, but you need to understand how available they will be, and what happens if they fall ill. With larger practices (say over 12) it is not uncommon to ‘buy’ the partner or director at interview, only to find all your dealings are with the office junior. Practices of 3-12 often combine the best of both worlds, the benefits of larger practice with the approachability of small practice – ‘big enough to cope, small enough to care’. Don’t be afraid to ask how each practice is structured, who reports to whom etc, because that feeds through into who you end up dealing with and how. The other related issues are what the purpose and vision and mission of each practice is (a look of stunned surprise? ), and even what the succession plan is – it is important that you can be confident that the practice you buy into now will still be around in 5-10 year’s time, because your project is likely to take that long to come to fruition. You need to understand the costs, but do not make this the sole criterion for selection. Why? Because you should not underestimate the power of design, whether good or bad – the potential value created (or missed out on) far exceeds the cost paid in fees. You should therefore look at value, not just cost. Ask about how different parts of the service are charged for. It is common for architects to use a percentage fee arrangement; this is a good format where (as in most cases) the solution cannot be accurately described at the outset – this is because the process should be a fluid and exploratory one. The percentage fee calculation is updated as the design is developed and the product becomes better defined and therefore better costed; you will need the help of a Quantity Surveyor for this. If your project is a big one you should start with a long list of say 6-12 practices; for a smaller project, 3 or 4 will be plenty. Recommendations count for an awful lot, so ask around within your own church hierarchy, and within other churches locally. If someone makes a recommendation, ask for the name of the key person they were dealing with. Then perhaps supplement these names with others sourced from the internet, which should either be local or have a relevant specialism. You can also ask the RIBA client services group for recommendations. If you have a historic church building, then you should, at least from courtesy, ask your inspecting architect whether they are interested in pitching for the project. 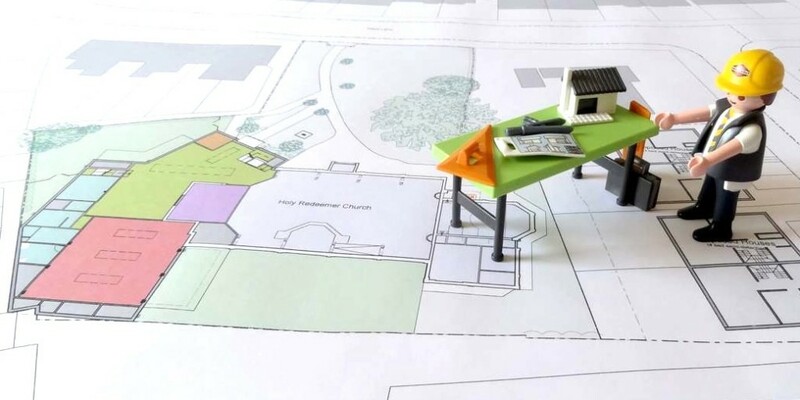 Church architects come in all shapes and sizes, and they may or may not have the requisite skills for your project, but it is important they know what is going on and are given the opportunity to take part in the process. Once you have some names, look at practice websites and other information and reduce your list to 3-6. Contact each of these with a brief description of the nature of the project, and request information on the practice. From this information whittle your list down to 2-4 names who you will invite for interview. Make it clear you want to understand how each practice would approach the project, not to see specific proposals; if you have a plan of an existing building, or of a plot if a newbuild, that will help. So what are you looking for at interview? Remember what it is that you are buying – it is not a product or a solution, but a relationship. Do not let your head be turned by someone who comes along with a glitzy proposal – good design takes time, and the right result will come out of a relationship that has not yet started. It is, however, good to see someone who has done their homework on the local area, the church, and any existing buildings. Understand that at interview, any architect worth the name will also be interviewing you. Great buildings are created out of the partnership between great architects and great clients; a poorly organised client will be ‘high maintenance’, and the building will suffer. A good architect will therefore want to understand how well you are organised and, frankly, whether you are serious. Reflect on the questions they ask of you – do they see this as a building project, or as a mission project that happens to involve a building? And crucially, how well do they listen? Ask for testimonials from other clients. Ask for examples of other projects you could go and visit. Before you conclude your process you should follow up on these references. Many churches feel much happier dealing with someone who shares their Christian faith. You will need to think that issue through for yourselves, but our view is that this is helpful but not essential. You may well find the right mix of skills in someone who would not (yet) describe themselves as a Christian, and it may be that working with you will bring them closer to a living faith. On the other hand, someone who does not have a feel for how churches work (culturally, in worship…) will need a lot more ‘coaching’ in what you need compared with someone who lives and breathes that culture. The most important question is: will they listen? Ask about how your project fits into their practice – why it is important. You want a practice that will give your work the attention it deserves. What is the culture of the practice? If we appoint your practice, who will we be dealing with? What level of Professional Indemnity insurance does the practice carry? But the key question is: Do I trust this person – how good is the ‘chemistry’ between us?